The Roundup made its debut in 1954, manufactured by Frank Hrubetz, USA. The ride was a quick success with licenses being issued in Europe (Swedish-based Gunnar Manson),Australian-based Ferrari, UK-based Cadoxton and Sam Ward’s Meteorite. 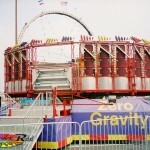 The ride movement is essentially a Rotor / Gravitron on a 50° angle using centrifugal force to keep riders in place. . 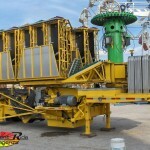 The ride comes in 24 and 32 person units, racks on a single trailer and can be set up in 1.5 hours, making it appealing to the show owner. 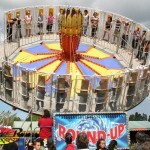 The Roundup remains a popular with an appeal that has lasted through generations of carnival-goers. In 2003, Dartron premiered a modernised design under the name Zero Gravity with improved loading, 33 person capacity and refined portability. There are approximately 15 Roundups in Australia, at least 40 in the UK and 70+ in the USA. Hola, soy panameño. Visito tu página desde hace casi 10 años. Es muy grata la oportunidad de participar con comentarios. Felicidades! Este juego Round Up es mi favorito desde que tenía 3 años de edad (1975). Mi familia iba a las ferias en la ciudad de Panamá, en medio de los edificios de la Cuchilla de Calidonia y en Vía España al lado del Banco Nacional, y ahí mi atracción hacia esa máquina, al ver su belleza y a la vez, me llamaba la atención que las personas no se caían (a esa edad no comprendía la fuerza centrífuga). La versión que siempre traían a Panamá, era la de la primera foto, la de la corona sobre el eje central. Luego, a finales de los 70, venía sin corona. En los 80s vino por pimera vez la versión Super Round Up, más grande, con 6 espacios más para 6 pasajeros. Nunca más volví a ver la luminosa versión de la corona y luces fluorecentes blancas, amarillas y azules hasta 1990. Me emocionó verla otra vez. Visualmente este juego luce mejor en esa versión que en las nuevas, que me parecen más obscuras. Hace ya varios años que este juego no viene a mi país. La única feria anual que nos visita es una feria centroamericana llamada Play Land Park, que en lo personal, ha decaído bastante y ya no trae esta máquina. Hello, I am Panamanian. I’ve visited your page for almost 10 years. The opportunity to participate with commentaries is very pleasing. Congratulations! The Round Up is my favorite since I was 3 years of age (1975). My family went to the fairs in the city of Panama, in the middle of the buildings of the Blade of Calidonia and in Via Spain next to the National Bank, and that started my attraction towards this machine, when seeing its beauty and simultaneously, fascinated that the people did not fall (at that age I did not understand the centrifugal force). The type always brought to Panama was likethe first photo, with the crown on the central axis. At end of the 1970’s, it came without crown. In 80s came a super version of the Round Up, with spaces for 6 more passengers. I never returned to see the luminous version of the crown with white, yellow and blue lights fluorescents until 1990. Visually this ride lights up better in older versions than in the new ones, that seems darker to me. Already for several years this ride has not been coming to my country. 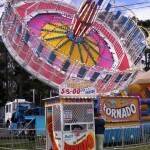 The unique annual fair that visits us is a Central American fair called Play Land Park, who has decreased in size and no longer brings this ride. How many revolutions per minute? I last looked at your site on 4/5/2005. At the time you had on page 2 of 3 a photograph with following caption: An interesting German-built unit, with sit-dowm seats! Notethe rider sitting the wrong way up. This 800×600 161 KB was merely a thumbnail. Do you have it anywhere, where the upside rider can be seen? I thank you in advance, for any attention you can give this. Best ride at any traveling carnival by far- probably because just about anyone can ride it :) Can put you to sleep but if you get bored on it, you could always try spitting on your friend beside you, not that I condone it, since it normally hits you in the face. Love this ride! I went on it for the first time this past summer (2009) and loved it. I wanted to get back on, but I ran out of money. I haven’t gotten the opportunity to try the “Zero Gravity.” I went to a perminent park that had it, but it wasn’t opperating. I was sad. Next year (hopefully) , I’ll be able to get on both…. THIS RIDE LOOKS JUST LIKE THE GENIE!!! !BTW IT ROCKS RIDE IT IF U EVA SEE IT!! BTW: ISNT THIS THE SAM AS CHAOS?? I remember seeing a tire drive Round Up when I was younger. 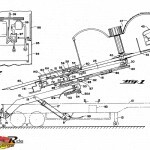 A lot of those older rides had tire drives along with hydraulics. The old Trabants and Casinos were tire driven, too. HI, LAST YEAR MY FRIEND AND I WENT ON THE ROUND UP AT MY COUNTY FAIR IN MARYLAND AND IT WAS AWESOMEE! Also a popular ride in germany but not many in operation today. Most were built in the 70s by Klaus Engineering – one made in 1978 is since then continuosly in use till today in Heide-Park. A midway classic. Someone mentioned the chain as the only restraint. True, what is that chain really going to do? The HUSS UFO is a bit bigger and scarier, as it goes completely vertical, unlike the Round Up which goes about 45 degrees. This came to our local fair for one year back in the mid 90s. It wasn’t one of the usual haunts (like the Rock-O-Plane, Octopus, Himalaya and Cobra) so we were pretty wary of it. Once I was finally persuaded to get on it, just loved it! 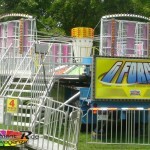 Made trips to the fair while it was in town just to ride this a dozen or two times! Was very sad it didn’t make a reappearance and haven’t seen one since. If you get the chance to ride it, do so! It’s a lot of fun! Oh! I rode Round Up with Genesis at The Fun at Walmart Parking Lot on Friday, March 9, 2018! CTtransit 1758 and CTtransit 490! Brilliant ride; especially for chubby people like me. There is no bar to hold you in. On a ride with a safety bar I’m to big for the bar to go across my lap, so the operator refuses to let me ride those rides.